For this game, we go back to Arsenal’s pioneering days when they became the first team south of Birmingham to play in the Football League. Sorry, but we don’t have a programme for this game. As far as we are aware there are none in existence. Woolwich Arsenal’s inaugural Football League appearance was played at the club’s “new” ground, the Manor Field, having vacated the Invicta Ground during the summer. A bumper crowd, travelling from all parts of London, turned up to witness the first Football League game played in the south of England. Joe Powell had the honour of captaining Arsenal for this historic game and won the toss, allowing Newcastle to kick off at 3.30pm on a glorious Autumn afternoon. Newcastle started well and caused a commotion in Arsenal’s penalty area from a corner, Charlie Williams fisted away and William Jeffery eventually cleared. But Arsenal drew first blood when, after just six minutes of play, Elliott broke through, fed Charlie Booth on the left wing and his cross found Walter Shaw who, with a terrific shot, put the ball into the net just out of Ramsay’s reach. This maiden League goal was met by rapturous applause from the crowd. The game then settled down, play was very even with each team playing different styles: Newcastle playing more as a unit whilst the Arsenal players preferred to create their own chances. This was much in evidence as Newcastle had a good spell of possession resulting in Jock Sorely forcing Williams into a good save, and winning a series of corners. In amongst Newcastle’s possession, Arsenal twice broke away and James Henderson was unlucky to hit the post and also headed wide from a Booth cross. Shortly after the break Arsenal went further ahead when, following an impressive solo run from his own half by Booth, Arthur Elliott beat Alex Ramsay with a stinging shot. There was a hint of offside by Elliott but the referee was not best placed to see it. Thinking that they had won the game, Arsenal eased off which allowed Newcastle to continually press the Arsenal goal. Powell and Williams seemed to be equal to everything Newcastle threw at them but eventually, after 65 minutes, Tom Crate got through to score through a melee of players. This goal spurred the Magpies on and they equalised in a similar manner a couple of minutes later through Sorley, despite protests for offside from Arsenal. This resulted in a frantic finale as both teams went all out for the win, but no more goals were scored resulting in a 2-2 draw which, on the balance of play, was the fairest result. Woolwich Arsenal: C Williams, J Powell, W Jeffery, D Devine, B Buist, D Howat, D Gemmell, J Henderson, W Shaw, A Elliott, C Booth. Newcastle United: A Ramsay, H Jeffrey, J Miller, R Crielly, W Graham, J McKane, J Bowman, T Crate, W Thompson, J Sorley, J Wallace. The crowd was entertained by the band of the 2nd Kent Artillery Volunteers. Joe Powell would go on to die in tragic circumstances. Complications set in having broken his arm in a game in 1896. He died a few days later from tetanus. His funeral was attended by several thousand fans as well as representatives from Woolwich Arsenal and other football teams. A collection was organised for his wife and children, and the money raised was used to buy a tobacconist shop to provide ongoing income for his family. William Graham wasn’t wrong with his prediction as Newcastle won the reverse fixture 6-0 later that month. 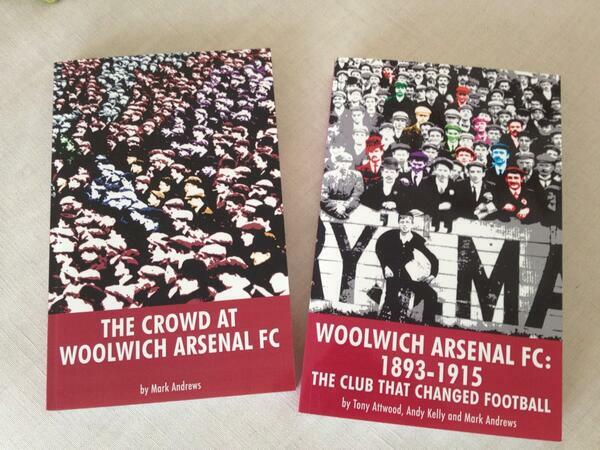 However, in this game a number of Woolwich Arsenal players, including Charlie Booth, were struck by stones thrown from the crowd. 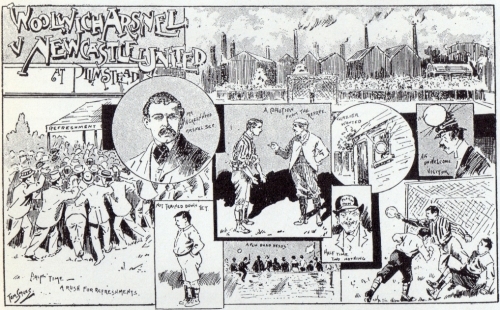 The Newcastle committee apologised for the conduct of the home crowd to Arsenal director Fred Beardsley whilst the team were at the railway station making their way home. Arthur Elliott has the distinction of being the first Arsenal player known to have been sent off during a game. He received his marching orders on 23 November 1892 against Ipswich Town for persistent foul play. This was J Bowman’s only senior game not only for Newcastle but for any team in England or Scotland. Something that we’ve only recently noticed is that, in the illustation above, both teams appear to be wearing their change kit: Arsenal in white and Newcastle in black and white stripes. For this season, Newcastle wore red as their home kit, as did Arsenal. Both teams were playing their first season in the Football League. Newcastle finished fourth, while Arsenal ended in the respectable mid-table position of ninth. There were some relatively high scoring games, no doubt influenced by fatigue caused by the travelling conditions that Newcastle’s captain mentioned. In the FA Cup Arsenal had to play in the qualifying rounds, and won their first game 12-0 against Ashford. This still stands as the club’s joint highest win in a competitive game. Having successfully negotiated the qualifying rounds they were narrowly beaten 1-2 in the first round proper by Sheffield Wednesday. Newcastle reached one round further but were beaten 2-1 at home by Bolton Wanderers. 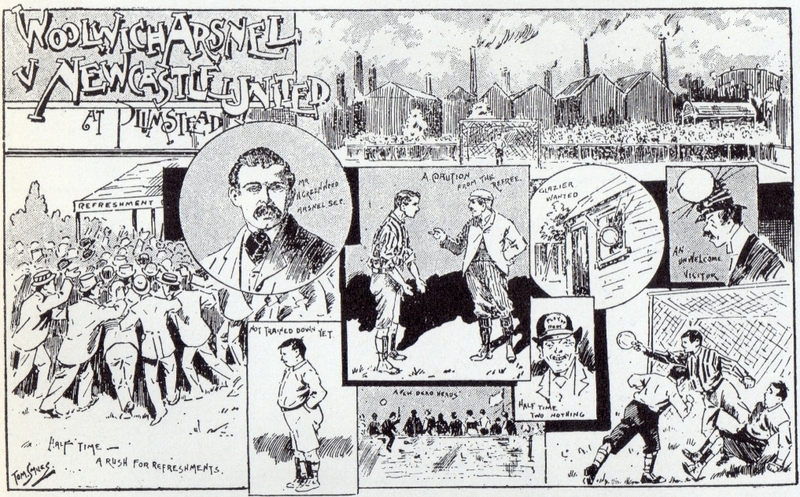 On the same day, Royal Ordnance Factories played their first game and won 2-1 against City Ramblers. ROF played their home games at the Invicta Ground, Arsenal’s home for the previous three seasons. Former Arsenal players Jack McBean, Morris Bates and Jimmy Meggs played for ROF in this game and they were joined later in the season by more of their ex-team mates. The Second Division comprised of an odd number of teams this season due to the late withdrawal from the competition by financially stricken Bootle who folded shortly after. Along with Woolwich Arsenal, Newcastle and Middlesbrough Ironopolis, Liverpool were also playing their first season in the Football League. They had cheekily asked to be elected directly into the First Division but were rebuffed by the League. However, they showed that they hadn’t underestimated themselves with this request as they easily won the Second Division without losing a game.